Rather than bore you all with the details of this year’s Congress on Research in Dance Conference (or the fact that the paper I’m meant to deliver tomorrow morning remains little more than a pile of notes and slides) I’ve decided to ask Zak, my “blog boyfriend” to fill in for me today. You may know Zak from his blog, Slow Down Son, or from his regular comments on my love life; turns out he was quite the serial dater himself back in the day, so grab yourself a cup of coffee (I’ll probably be on my fourth by the time you read this) and enjoy a little dose of (male) perspective! As it turns out: I do, and yes. And they’re related. As a serial dater, I struck out and went on 34 (and a half) dates in a nine month period. My goal from the get-go was simple (or so I thought): find a woman whom I was attracted to and with whom I could sustain a meaningful romantic relationship. My first date and I had spent hours on the phone getting to know one-another before actually meeting. Upon meeting, I was pleased to find we were smiling a lot and enjoying each other’s company, but also saddened that there was clearly no romantic spark. With the exception of Date #3, each date I went on felt like I was drifting further from my goal. In short, I became jaded by serial dating. It wasn’t until I met Date #20 (MJ ) that I started to get interested in dating again. Even though it wasn’t enough to make a sustainable relationship from those feelings, it was enough to remind me they existed. Data #22 (the Cupcake Queen ) really brought those feelings front and center. I found myself in a friends-with-benefits relationship with her. I wanted more, and she didn’t. I pressed on, trying to meet new people to see if these new-found (or was it re-found?) feelings existed for someone else—someone who actually wanted a relationship, too. But after a few more dates, I found myself back in the game. Only this time, I was playing a different game, one which in retrospect I’m glad I hadn’t fine-tuned. My experiences with online dating had left me emboldened. So much so that upon meeting someone, if I wasn’t terribly interested in her but found her attractive, I would text her to tell her my thoughts about hooking up. At this point I was having such terrible luck at finding Ms. Right that I decided I should at least be trying to find Ms. Fun for Right Now. A few times, I came close a few times to finding a “taker,” but ultimately I kept losing interest whenever the Cupcake Queen would re-enter the picture. It finally did happen, though. One weekend the Cupcake Queen shrugged me off, and I managed to sweet talk my way into having a one-night stand. I never gave her an official number, hence the whole “34 (and a half)” business. I’ll say this: I’m not proud, but I’m also not ashamed. I didn’t con, bribe or otherwise sell that encounter as anything more (or less) than it was. We were two consenting adults, and it happened. If you had asked me before Ms. 34 (and a half) what my feelings were regarding one-night stands, I’d have told you that I wasn’t interested in actually pursuing a relationship like that. I had – as I suspect many males and females alike have – fantasies and desires about hooking up with certain people I found attractive but I never pursued them. If you ask me now, after my one-night stand, I’ll tell you the same. My fantasies and desires should remain just that: fantasies and desires. For me, the actual hook-up and the subsequent one-night stand were unexciting. 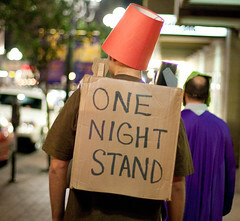 To this day, I still feel that the more in love with someone I am, the more I find myself getting turned-on, which I think is directly related to how unexciting the one-night stand actually was. Serial dating, however, I view positively. Regardless of the fact that I failed at my goal of meeting a special someone and building a romantic relationship with her, serial dating had positive side-effects. My confidence level, thankfully, rose significantly. (I was coming off a divorce and two years out of the dating scene.) My knowledge of local hot-spots and things to do around town was greatly improved since I had to be creative and find places to meet dates. Most importantly though, was that I met several people as dates that have since transitioned to friends. Close friends, in fact. That was almost six months ago, and the rest, as they say, is history. Did you respond differently to the real-life encounter compared to the ladies you met when you were serial-dating? Was she more attractive because she hadn’t labelled herself as ‘looking’? Nice guest post, btw. I was a lot more nervous. With serial dating, as you pointed out, the ladies were “looking,” whereas Ms. D was “not dating” when I met her (actually, she still claims she’s “not dating” but calls me her boyfriend. Go figure). I spent about a month asking her out and pursuing her before I truly held her hand for the first time (I had tried once on our second “date,” but she was clearly tentative about the whole situation). By the time came around that we kissed for the first time, I knew how I felt for her: I was’t just physically attracted. I don’t know that Ms. D was more “attractive” because she wasn’t looking, but by getting to know her over such an extended time frame (I had met her a year or so earlier), and knowing her as “her,” not as a fellow dater, my feelings felt a lot more honest. I find it interesting that you changed tactics while you were dating and seemed to hope that not talking on the phone and how dating more just kind of made you more and more jaded toward it. Having it be a game instead of an actual destination to finding love. I’ve been with someone before who is like your ‘Cupcake Queen’ who you think, or hope, that they will maybe try out a relationship with you but they’d rather not. I’m glad it turned out that the serial dating was still a positive experience. I think out of everything we are put through with life, we can find something positive, or something that made us grow as a person. I’ve been trying to comment for the past 2 days, but I keep getting sidetracked. I don’t know how anyone survives in the online dating world today. I know that I wouldn’t have had the stomach for it. I agree with Sarah that love chooses you – you can’t find it, search for it, or control it to appear on command. Although, I know that online dating has worked for millions of people…. I realize you were young and inexperienced at the time, but in hindsight you should have chosen your parents more wisely.